The first church in Orange County was built by Don Bernardo in 1860. A priest came from the Mission San Gabriel to serve this church. In 1869 St Boniface Parish was established and served all Catholic families in Orange County. In 1924 the first Catholic Church in this general area was built on Euclid and Main St., and the parish was served by the priest from St. Boniface. 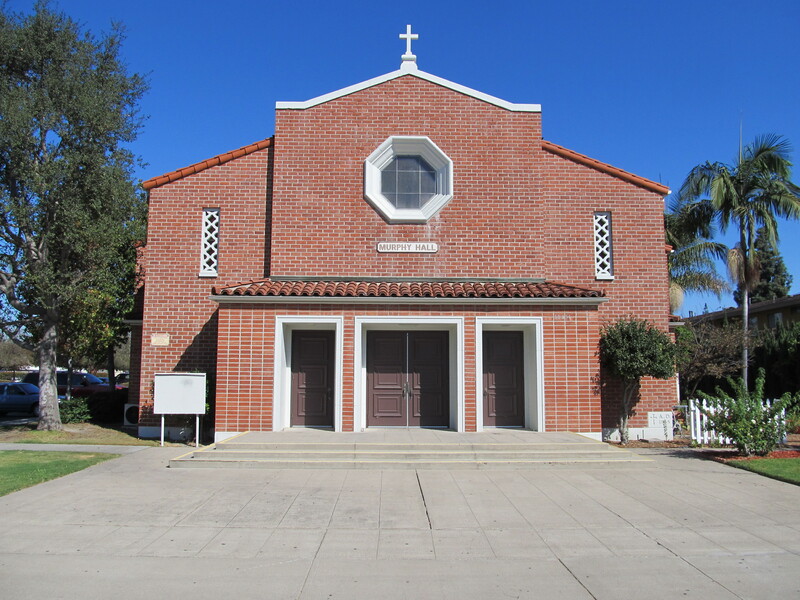 The Columban Fathers arrived in 1941 and took up residence at St. Isadore’s which is still standing on Katella in Los Alamitos. A more centrally located church was needed. Thirty-five isolated families met at 4th and Stanford Streets, and a parish church named Saint Columban was dedicated in 1947 by Bishop Manning. A house of sorts was moved onto the property and called the rectory. For the first time, Garden Grove had a resident priest. In 1945 World War II ended, causing an influx of people. Orange groves and chicken ranches gave way to commercial enterprises. Over the next 10 years Garden Grove expanded from 3,000 people to 100,000. In seven years the original thirty-five families increased to 600 families. In 1950 the Chancery purchased land on which we are now located. Saint Columban parish was large enough to become a parish entity. Monsignor Murphy was appointed as the first pastor in 1953. What is now known as Murphy Hall was the church built in 1956, but, with the idea that it was temporary while the new church was being built. Murphy Hall seated 900. This church was the third church to be built in 21 years to serve the Catholic people of Orange County. 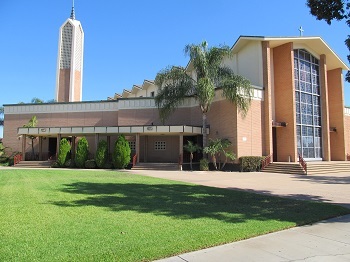 Knowing all along that the Garden Grove community was growing at a fast pace, the construction for the new church began in 1968 and was dedicated by J. Francis Cardinal McIntyre. The current church seats 1,434 worshippers and is 152 ½ feet long, 182 feet wide, and is constructed so that no member of the congregation is seated more than 100 feet from the main altar. The walls are covered with Roman Travertine marble. The stations are in mosaic and flow in a panorama of the sorrowful journey. Throughout the years, Saint Columban’s parish has experienced an enormous amount of growth. In fact the parish size has more than doubled. We currently have over 6,000 registered families of more diverse cultures and celebrates Mass in English, Spanish and Vietnamese. Each of these cultural communities brings something special to our parish and we are all grateful for each other’s presence. We feel fortunate to be a part of a multicultural community and look forward to growing together in Christ’s love.